Ok, I know this is my third post for the weekend, but I’ve felt really creative and found a few challenges that I was inspired to play along with. This time I’m playing with challenges over at Inkspirational Challenges and Just Us Girls. 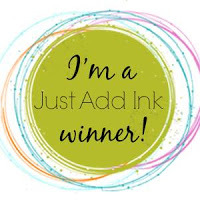 Inks – Catherine Pooler Designs – Tiara, Tiki Torch, Bellini, Garden Party, Lime Rickey & Grass Skirt. I stamped the main floral image and roughly coloured with CP inks, then I die cut out the word hello and popped them up with dimensionals and layered on cardstock I coloured with the inks to match. Thanks for looking and enjoy your day. I had some time on Saturday before watching the AFL Grand Final to make a couple of cards using a new to me stamp set from Stampin Up called ‘Coffee Cafe’. It’s a really cute set with matching dies so I can save on the fussy cutting which is not my forte. I think I need to go and make myself a coffee now! Today I’m playing along with two challenges with one card and a new stamp kit. I used the layered sketch from Try Stamping on Tuesday Challenge #341 and was inspired by the colours, patterned layers and childish theme over at The Card Concept Challenge #78. The papers and sentiment were from the September Simon Says Stamp kit – Best Ever. I stamped the sentiment 7 times using my MISTI to keep everything aligned and added a few shape sprinkles for an extra pop. Author tinstar05Posted on September 29, 2017 5 Comments on Two Challenges in One! Each month I hold a card making class for a few of my friends. It’s a good opportunity for us to catch up for a chat with the added bonus of making cards. This month I was challenged to use 1 main stamp set as my focal image for the 3 cards they’ll make. That was a toughie so I went to Pinterest for inspiration. The main image on all 3 cards is from My Favorite Things called Color Drops and has raindrops in 6 different sizes and circles in 5 different sizes. It’s a fabulous stamp set which I will be using much much more often! I love the challenges over at CAS-ual Fridays and who can pass up an opportunity to make a shaker card? This card came together really quickly as I have a whole container of already water coloured and fussy cut out critters that when the inspiration hit I’d be ready to roll! Thanks for visiting and have a great day. Today I created a card for the Addicted to CAS challenge #120 Florals. I am a CAS girl at heart and love a good floral card so this challenge was perfect for me. I used a stamp set called Mondo Magnolia by Ellen Hutson (borrowed from my friend Michelle) and coloured it with my Chameleon markers (V04 and PR4) which were a birthday gift from said friend. The sentiment is from Altenew called Label Love and my finishing touch is some purple twine from the Twinery. I loved the current challenge over at The Flower Challenge which is a tic-tac-toe challenge. I love challenges that help me with the direction of my card, especially helpful when I might be lacking some mojo – LOL. I chose the diagonal of embossing, watercolor and colour (blue) for my card. I clear embossed the Dahlia Close up stamp from the Ton, then water coloured it with my Prima Confections Classics, which are the neatest little tins of water colour tints. I cut the image on an angle, layered it on some gold cardstock, then stamped the sentiment from Clearly Besotted called ‘Message Me’. What do you think? I’m pretty pleased with how it turned out.